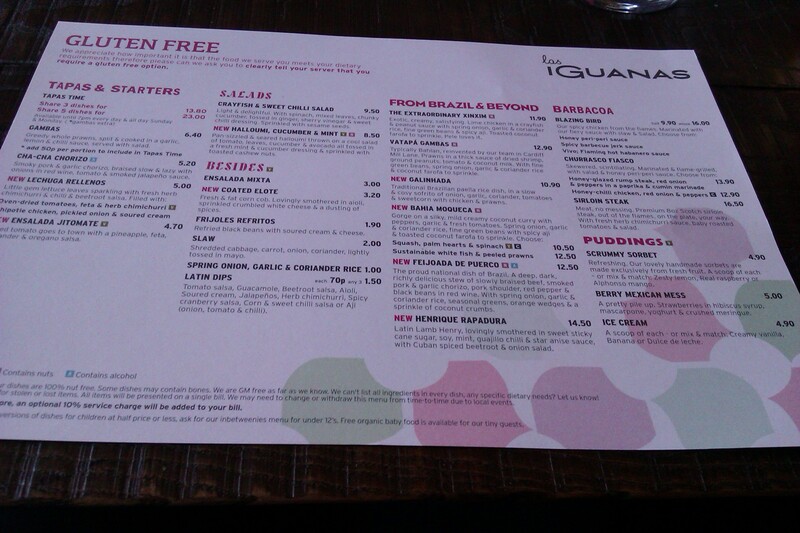 I was keen to get out for a meal for Gut Feeling week, and I’ve also been keen to try out Las Iguanas since it opened in Royal William Yard in Plymouth recently. So when my wife, Abby, mentioned her friend had invited us to Las Iguanas for her birthday meal I was more than a little excited! I have always been a fan of Mexican so was keen to try out the “authentic South American food, made with passion, love and lots of Latin magic.” Las Iguanas is a chain and you can find a list of restaurant locations here. The good news is that they offer a separate gluten free menu. I had previously visited one of the Bristol branches and whilst the menus were clearly labelled with the gluten free options, I’d never been offered the separate menu before, so I wasn’t sure if it existed other than on-line. However, when we arrived we mentioned to the waitress that we (Abby was also gluten free as she is eating gluten free this week to help support Coeliac Awareness) needed to eat gluten free we were immediately presented with the GF menu. On this occasion I decided to go straight for the main, and I had been eyeing up a certain dish all week. 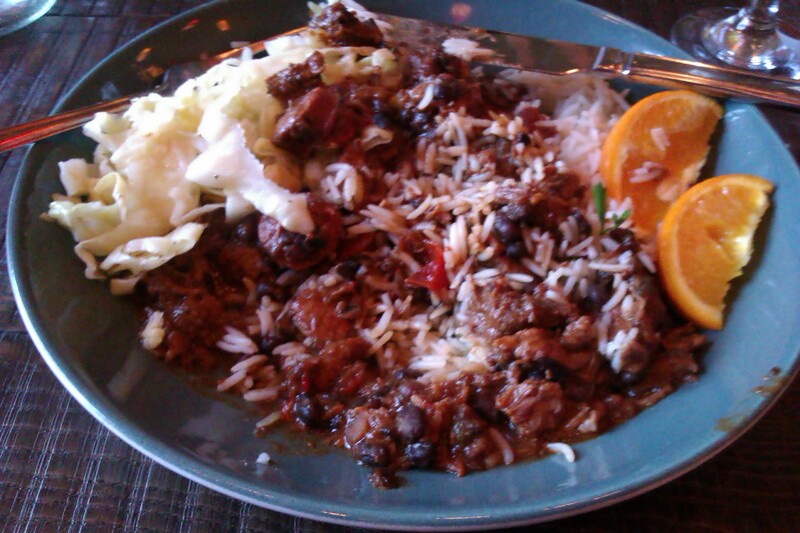 The Feijoada de Puerco is apparently the proud national dish of Brazil. Described on the menu as “A deep, dark, richly delicious stew of slowly braised beef, smoked pork & garlic chorizo, pork shoulder, red pepper & black beans in red wine. With spring onion, garlic & coriander rice, seasonal greens, orange wedges & a sprinkle of coconut crumbs”. Mouth watering yet? I also went for a side of refried beans as I’d skipped the starter. Abby went for the Moqueca which was a squash based creamy coconut curry with rice and spinach. Unfortunately the gluten free vegetarian options were very limited so she didn’t have a lot of choice. It was slightly too spicy for her, though she doesn’t do spicy really. I took advantage of a rare occasion that I could sample some of her food while we were out, and thought it as very tasty. I have to say my dish was absolutely amazing. So much flavour and I loved every mouthful, I’d definitely have it again. The refried beans were good, but not a patch on Abby’s famous version! Of course despite being full I couldn’t only review one course so I went for a dessert too. 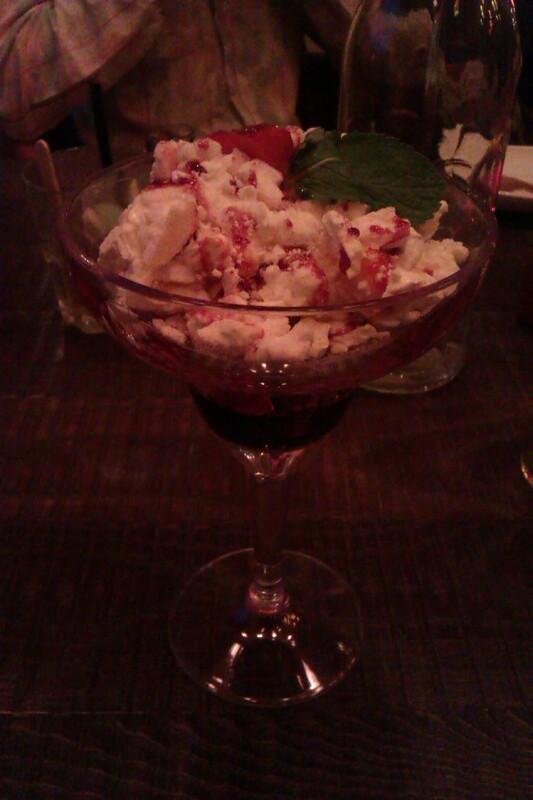 There was a choice of sorbet, ice-cream or a “Berry Mexican Mess” which was described as “A pretty pile up. Strawberries in hibiscus syrup, mascarpone, yoghurt & crushed meringue”. I did have a quiet chuckle to myself after ordering when I suddenly thought “did I just order fruit for pudding?” but thankfully this was more like an Eton Mess and was delicious. The hibiscus syrup was particularly tasty. The dishes were always confirmed as gluten free as they were served without us needing to ask and that gave a level of confidence. I am happy to say I suffered no reaction either. Unfortunately anything fried was not on the gluten free menu which meant salad instead of chips with some of the dishes. One disappointment was that the tortilla chips were not GF so there were no chips and dips to nibble on at the beginning of the meal. They appeared to be made on-site so presumably this was a cross contamination issue in the way they were prepared. The only other disappointing thing was that I had the car! There were an amazing array of cocktails and tequilas flying around the table and I was very envious. I would definitely like to come back for another go, and next time I will NOT be driving. Good review Kevin. New GF dishes @ Bistro One including the amazing Lovely Lovely Cake! Oh I’ve always waned to try eating here, shame I live in the middle of nowhere!! I will have to pop in next time I visit somewhere that has one!